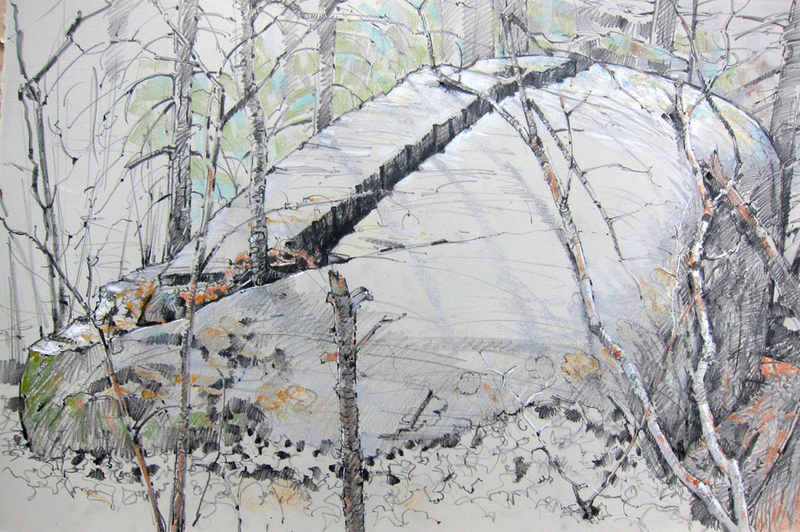 A single-boulder quarry hidden in the Petersham woods. I spent almost all of Sunday drawing a single-boulder slab quarry. 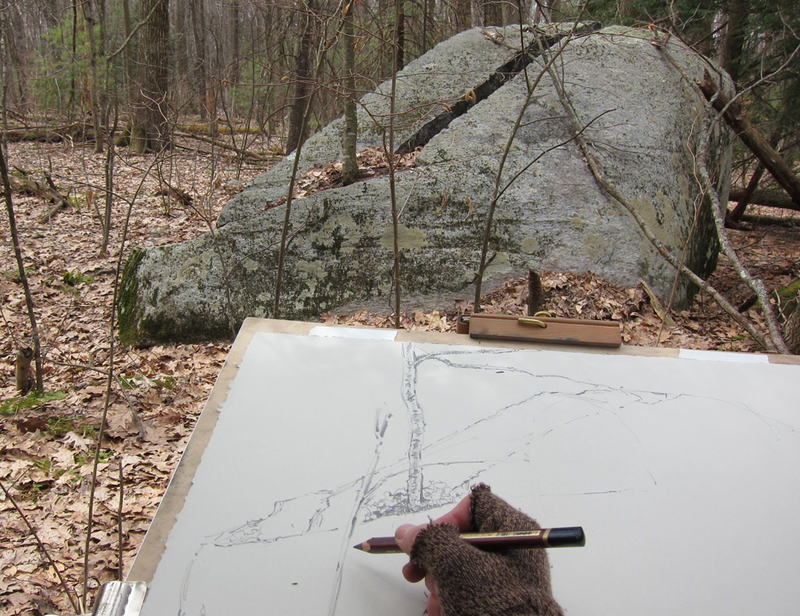 My project here in Harvard Forest is to make drawings of certain things, namely, the abandoned ruins of early New England settlement being reclaimed by nature. Nature tends to do a lot of reclaiming, given a time. A farmstead is abandoned, the house falls in, trees gets a toehold and before you know it, there’s nothing remaining but a cellar hole and miles of stone walls winding through a sylvan wilderness. There are other links to daily life and industry constructed from the stony bones of the New England soil: grist mills and saw mills, a tannery, anonymous structures. Much is built from rocks that were collected as a side product of the Herculean task of plowing, but for finer work with square corners, sharp edges and flat surfaces, you needed a quarry stone. I think of rock quarries, and picture sweaty guys with pickaxes and drills working in big, open pits. But the pre-20th century Petersham farmer wanting a block or two for the front steps gets out his toolkit, goes to the elephant-sized boulder at the edge of the field and splits off what he needs. Free rock, and plenty of it. Labor not included. 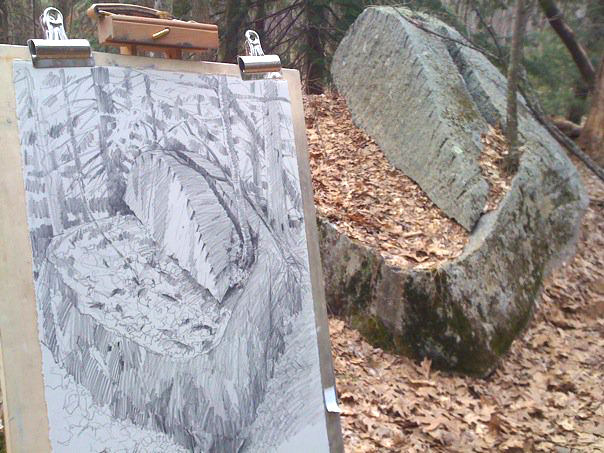 Which leads me to the single-boulder quarry, the one I was drawing yesterday. Deep grooves spaced along the top of the cut showed where chisels and wedges were pounded in with mallets (wielded by sweaty guys) until the granite cracked, split and fell away from the mother stone. A narrow gap sliced down the center is marked by regular grooves, and a young birch is growing opportunistically at the lowest end, fed by decaying leaves and watered by rain sluicing down through and over its roots. Oaks and hemlocks surround the boulder, and high in the top of one of them I heard the first pine warbler trill twice, announcing that another year has passed and spring arrived again. It’s the little details like this that bring history out of the frozen past into the sunlight. Keep those cards and letters coming! Thank you for the beautiful pictures and the explanation about stones and quarrying. When the land is left alone, nature comes back as she was. they say the heavy jungled plug between Panama and Columbia was all cleared and growing corn before Columbus et al. 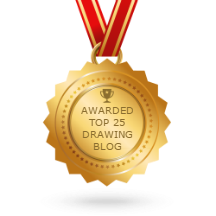 I love how you get to the marrow of things in your drawing. Even with what appears to be flat lighting, you come up with this brilliantly lit ROCK! And you can’t stop looking at it. That’s the thing. Thanks for bringing it to life. Beautiful! In the right hands, a pencil is so much better than a camera!